SOP faculty publish on the best methods to produce world-class professionals in the field. The majority of the students surveyed appreciated the benefits of active learning methods, thereby signaling the effectiveness of SOP’s innovative teaching approach. In effect since 2017, LAU’s Third Strategic Plan (SPIII) has as its first pillar Intellectual Capital and Knowledge Management, which is a commitment to raise the university’s research standing to the same levels as its undisputedly stellar teaching record. 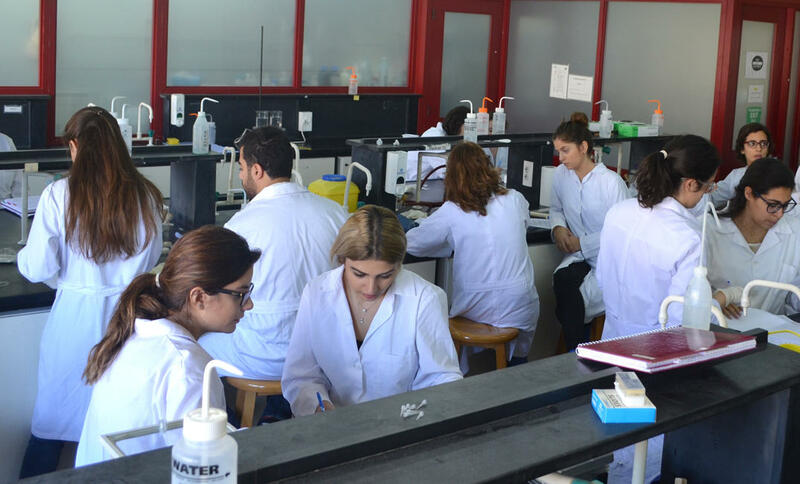 Within this framework, LAU’s schools have focused on strengthening their research capacities, an endeavor that depends in large part on the initiative of faculty members with the support of administration, often working in collaboration with each other to produce innovative studies. For example, three faculty members from the School of Pharmacy (SOP) recently teamed up to conduct research that led to the publication of an article in BMC Medical Education, an open-access, peer-reviewed journal dedicated to the training of healthcare professionals. The journal focuses in particular on “curriculum development, evaluation of performance, and assessment of training needs,” and in their study, SOP clinical associate professors Drs. Lamis Karaoui, Aline Saad and Soumana Nasser do just that. According to Dr. Nasser, in the LAU pharmacy curriculum competency in biomedical literature is “delivered to students in three courses throughout the pharmacy professional years,” specifically Drug Information and Literature Evaluation, Pharmacoeconomics, and Professional Pharmacy Practice Experiences. Dr. Nasser felt that to conduct research into the courses’ effectiveness “it was essential to plan and collaborate with key players in the curriculum and assessment of the Pharmacy Program” – namely Dr. Karaoui and Dr. Saad. The resulting study charts how knowledge in this area is delivered to students enrolled in the courses, and examines the end results in terms of what the students actually learned. As part of the project, the three clinical faculty members developed a survey that they administered to students at both the beginning and completion of the courses, comparing the results to already existing assessment data. In all three courses, students overwhelmingly reported having learned what the syllabi said they would for their learning objectives. Furthermore, most of the students surveyed (84 percent) appreciated the benefits of active learning methods in reinforcing acquired skills, thereby signaling the effectiveness of the SOP’s innovative teaching approach. Perhaps most importantly, as they moved from introductory to advanced courses covering biomedical literature, most of the students surveyed felt themselves ready to critically evaluate clinical trials – that is, to apply in practice the analytical skills they had acquired.